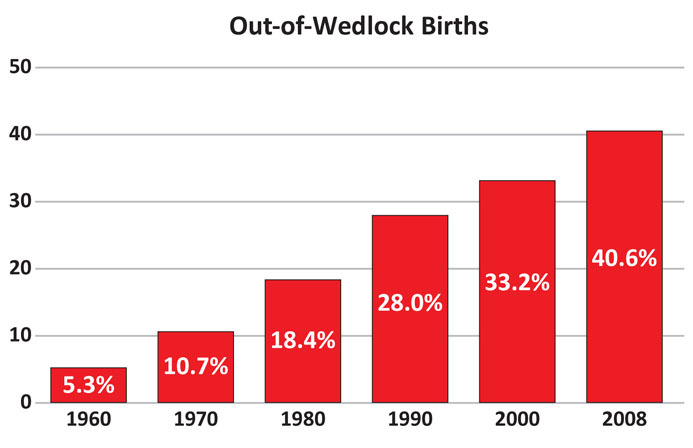 Most research focuses on two major causes for the growth in fatherlessness since the early 1960’s: divorce and out-of-wedlock births. 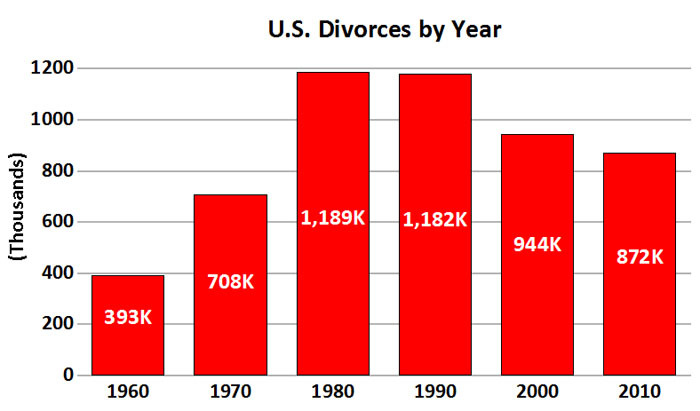 – The number of divorced adults in 2008 was 8,444,000 compared to 393,000 in 1960. Source: US National Center for Health Statistics, Vital Statistics of the United States, and National Vital Statistics Report, Table 78. *NOTES: The number above for the year 2000 excludes data for 4 states: California, Indiana, Louisiana, and Oklahoma. The number for the year 2010 excludes data for 6 states: California, Georgia, Hawaii, Indiana, Louisiana, and Minnesota. CDC/NCHS National Vital Statistics System. – In a nationally representative survey of adults ages 20-29, 88% agreed that the divorce rate is too high and that the U.S. would be better off if we had fewer divorces. Source: Whitehead, Barbara Dafoe, and David Popenoe. “The State of Our Unions 2001: The Social Health of Marriage in America.” Piscataway, NJ: The National Marriage Project, 2001. – In a telephone survey of 1,503 people, 94% agreed that divorce is a serious national problem. Source: National Fatherhood Initiative. With This Ring …: A National Survey on Marriage in America. Gaithersburg, MD, 2005: 4. – 50% of all the children born to married parents today will experience the divorce of their parents before they are 18 years old. – 40.6% of all newborns in 2008 were born to unmarried parents, a total of 1,727,950 children, the highest ever reported — up from 224,300 in 1960. Source: Ventura, Stephanie J., and Christine A. Bachrach. 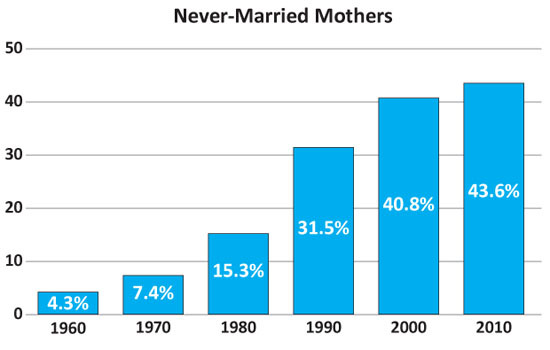 Non Marital Childbearing in the United States: 1940 – 99. National Vital Statistics Reports, Vol. 48, NO. 16. Table A. Hyattsville, Maryland: National Center for Health Statistics, 2000; see also Martin, Joyce A., Brady E. Hamilton, and Stephanie J. Ventura. Births: Preliminary Data for 2000. National Vital Statistics Reports, Vol. 49, No. 5. Hyattsville, Maryland: National Center for Health Statistics, 2001; Hamilton, Brady E., Joyce A. Martin, and Paul D. Sutton. Births: Preliminary Data for 2003. Vol. 53, No. 9. Hyattsville, MD: National Center for Health Statistics, 2004. See also Brady E. Hamilton, Joyce A. Martin, and Stephanie J. Ventura. Births: Preliminary Data for 2006. National Vital Statistics Reports, Vol. 56, No. 7. Hyattsville, MD: National Center for Health Statistics, 2007. Brady E. Hamilton, Joyce A. Martin, and Stephanie J. Ventura. Births: Preliminary Data for 2008. National Vital Statistics Reports, Vol. 58., No. 16. Hyattsville, MD: National Center for Health Statistics. 2010. – Nearly one in two children in single-mother homes live with mothers who have never been married. Four decades ago, that figure was one in sixteen, one- seventh of today’s figure. Source: U.S. Census Bureau Current Population, 2011.